Do You Have A Blocked Toilet Melbourne? There Are Many Reasons For A Blocked Toilet. It may be indicating that a larger problem such as a sewer blockage has occurred. There could be an obstruction in the toilet line such as toilet freshener or objects that have fallen into the toilet causing the pipe to jam. A blocked toilet Melbourne could have been caused by a build up of toilet paper that is blocking the sewer. How do you know if your toilet is blocked? When the water level of your toilet is slow to get away after flushing and the water level rises up to the top of the toilet. Thats a sure sign that your toilet is blocked. If you need help call Inner City Plumbing your Blocked Toilet Plumber on 1300 668 834. We are open 24 hours, 7 days a week for your convenience. A blocked toilet Melbourne can be caused by hair, larger debris, tissues or too much toilet paper being flushed down the toilet. Over time these types of blockages gradually build up and the flow of the water draining away from the toilet becomes slower and slower. Regular use of chemical drain cleaners does help to keep the waste system clear and fresh. External gullies, stacks and drains can easily become blocked with leaves and debris falling invariably finding their way into the drains. If these drains become so blocked that water ceases to flow this can also cause a blocked toilet Melbourne. A blocked sewer pipe can become a costly and destructive problem. Totally blocked pipes cause sewerage backup through floor drains or fixtures whilst partially blocked pipes result in a slow draining of the fixture and insufficient operation of fittings. Using our CCTV Camera we are able to investigate the blockage thoroughly so we may know the best course of action to take to resolve your problems. Hydro-jetting is a very efficient way of clearing blocked pipes and can stamp out even the most relentless of pipe clogs. The most common cause of blocked toilet Melbourne is a blockage in a intersecting service pipe between the home and the main which leads to the street. In the case of home and office plumbing, generally, the main cause of a blockage is the accumulation grease, hair, dirt, or other materials. For example: disposable napkins, broken dish ware, garbage, nappies, and other types of debris that should not be put in the drain. A blocked drain Melbourne plumber can fix these issues! The roots from large trees spend years weakening your sewer lines. If plant roots manage to wrap themselves around your line, then the roots will eventually work their way into sewer pipes. 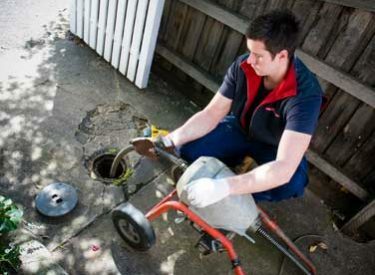 A blocked drain Melbourne plumber can work to repair any damaged or blocked lines. If you need a Melbourne Plumber at your location to unblock your toilet, then call us on 1300 668 834 for immediate service. Inner City Plumbing services all Melbourne Suburbs specialising in 24hr emergency plumbing, blocked drains, hot water service, gas and leak detection and general plumbing. We have been in this business for over 20 years and we are continuously growing. Our clients appreciate our friendly plumbers and how we use the latest technology to deliver high quality plumbing solutions. We work very hard to make sure all our customers are completely satisfied with our service. Our goal is to always exceed our customers expectations. Blocked Toilet Melbourne	Overall rating:	4.6	out of 5 based on 117	reviews.